I read this article and found it very interesting, thought it might be something for you. The article is called 10 Traditional Japanese Games You Must Know and is located at http://trip-n-travel.com/listicle/8838/. 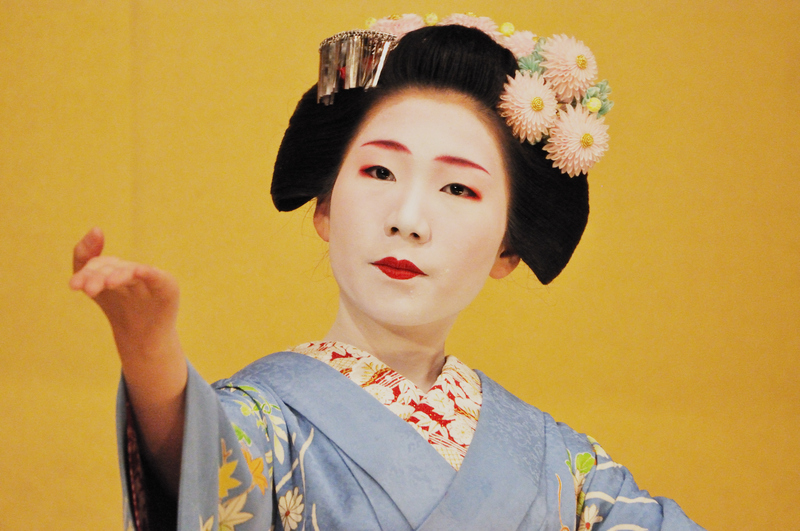 Japan has a rich history of traditional games which date back over generations. And though when it comes to games, visitors might first know this country for creations like the Mario Brothers and FF7’s Cloud Strife, let’s not overlook the lasting popularity as well as nostalgic value of Japan’s traditional games. So let’s learn about some of Japan’s most timeless and classic games. Even if you’re not into playing too much, there’s still a lot you can learn about Japanese history and culture through them. And maybe, the next time you’re perusing through the souvenir shop, you’ll also have a better understanding of the meaning behind some of the toys on display. 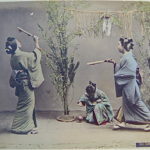 Hanetsuki – or Japanese badminton – is traditionally played on New Year’s and became a popular women’s game starting in the Muromachi period (1333-1568). 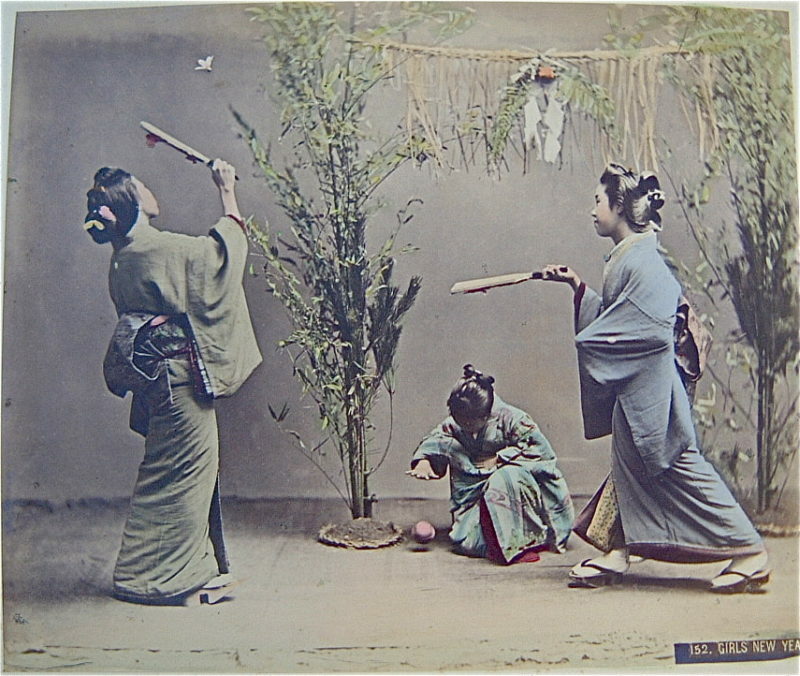 Unlike badminton, you don’t play with a net, but you do hit a shuttlecock (called a hane) back and forth using wooden paddles called hagoita. The object of the game is to keep the hane off the ground as long as possible. The loser ungraciously gets their face smudged with black ink so you have extra incentive to stay focused. 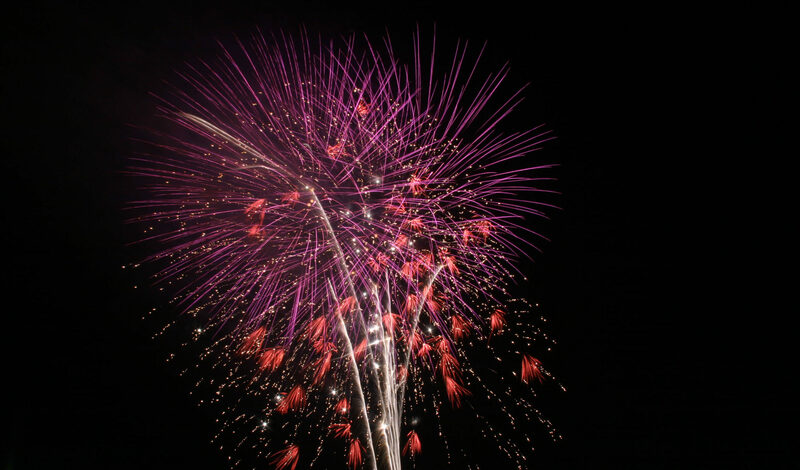 And the longer all the players can keep the hane in the air, the more luck they will have in the coming year. The game has declined in popularity recently but people today love to buy beautifully ornamented hagoita as collector’s items. 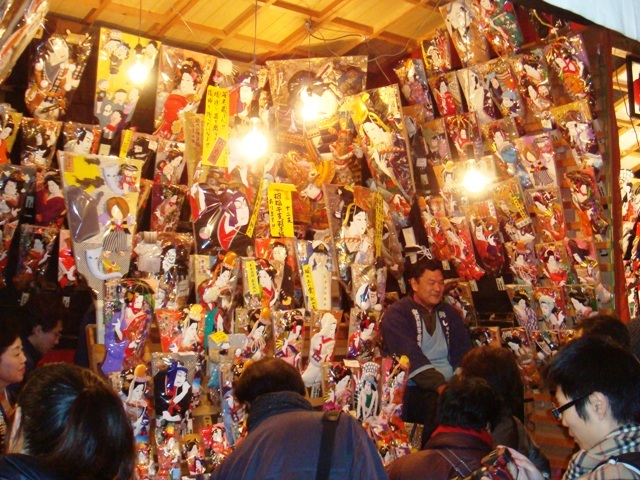 In fact, Tokyo hosts a hagoita market every year. 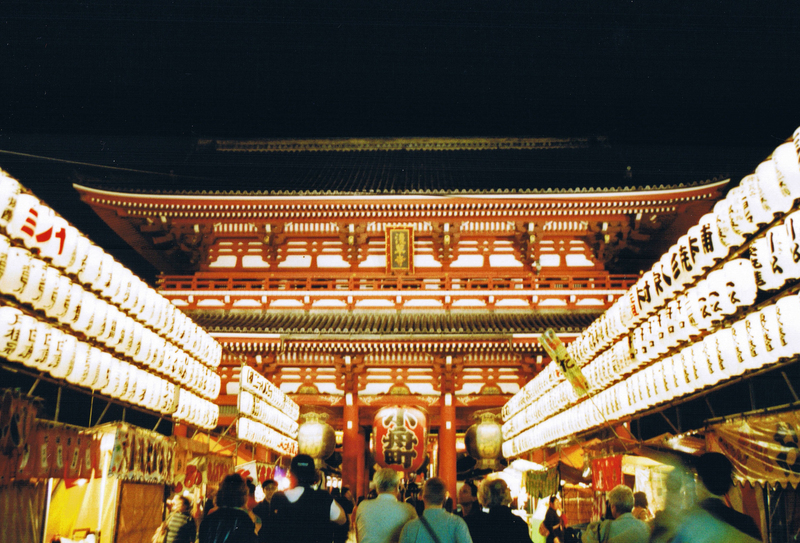 The Hagoita-ichi is located at Sensoji Temple in Asakusa in mid-December. 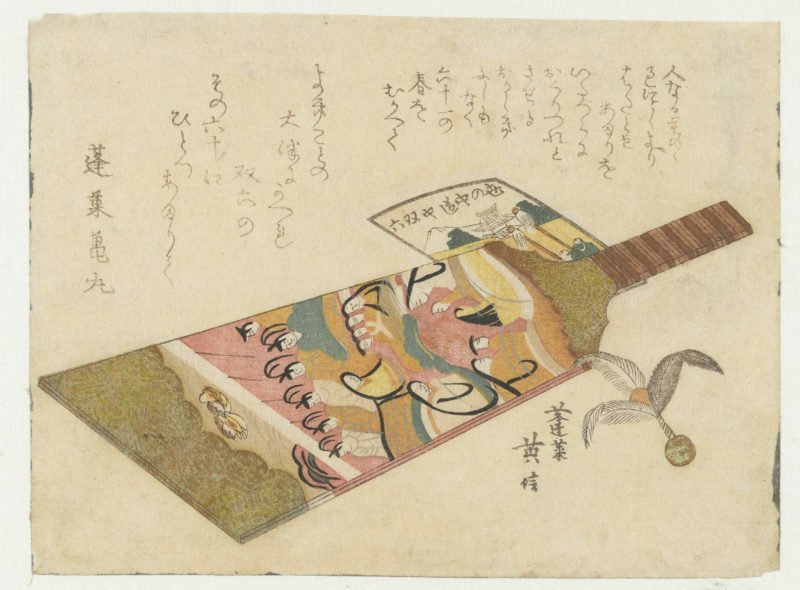 Paddles come in all different sizes and are decorated with elaborate portraits of kabuki actors, Edo era ladies, and even contemporary celebrities and politicians; Hello Kitty being one fan favorite. Pretty much everyone the world over will be familiar with this game. But what you may not know is just how much of a big deal janken is in Japan. The game takes on a whole new level of importance in this country, being the decision maker of choice for many aspects of everyday life including who gets the last morsel of food on the plate, or who needs to run to the convenience store when beer runs out at the party, or even who takes the heat for the company’s losses last quarter. School children especially may play this game hundreds of times a day. 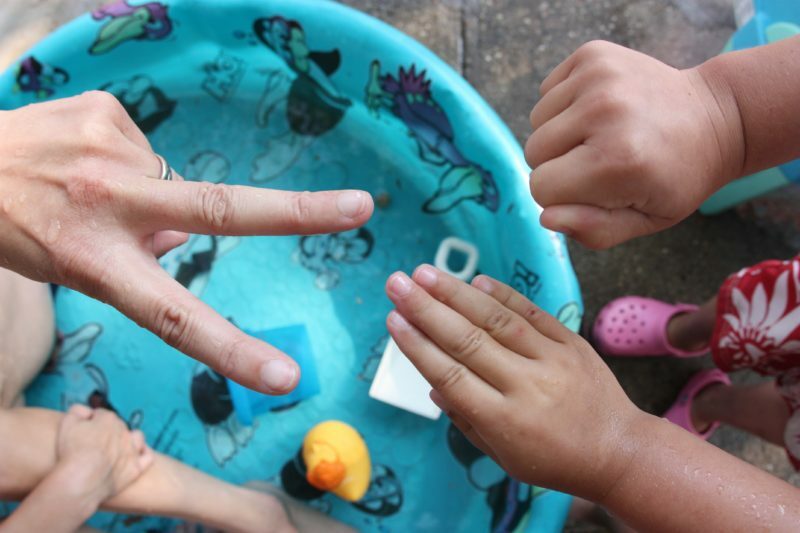 The relationship of each hand is straightforward: paper beats rock, rock smashes scissors, scissors cut paper. There are a few variations on the chant you use with the game. Here is the most common version. Start by chanting “Saisho wa guu” (さいしょはぐう), which means rock is first. Pump your fists three times to the chant. Quickly follow with “Janken pon!” (じゃんけんぽん!). On “pon”, show your hand (guu, choki, paa). If there’s a draw, chant “Aiko desho!” (あいこでしょ！). On “sho”, show your next hand. Kendama is a lot like a traditional “ball and cup” but so much more. Kendama is a wooden ball attached to a handle by a string. But the handle has two cups on its sides (one larger than the other) and one at its base, plus a spike at the top. A spike you say? Yes! The ball has a hole in it and advanced players are able to catch the ball using the spike. So the handle has four different parts to catch the ball. And the techniques people can use to flip the ball into the cup are pretty much as endless as human imagination. While the kendama can be dated back to at least the 18th century in Japan, it has recently taken on a lot of popularity internationally. Formal competitions are held where people can show off their most acrobatic kendama skills and people are inventing new moves all the time. 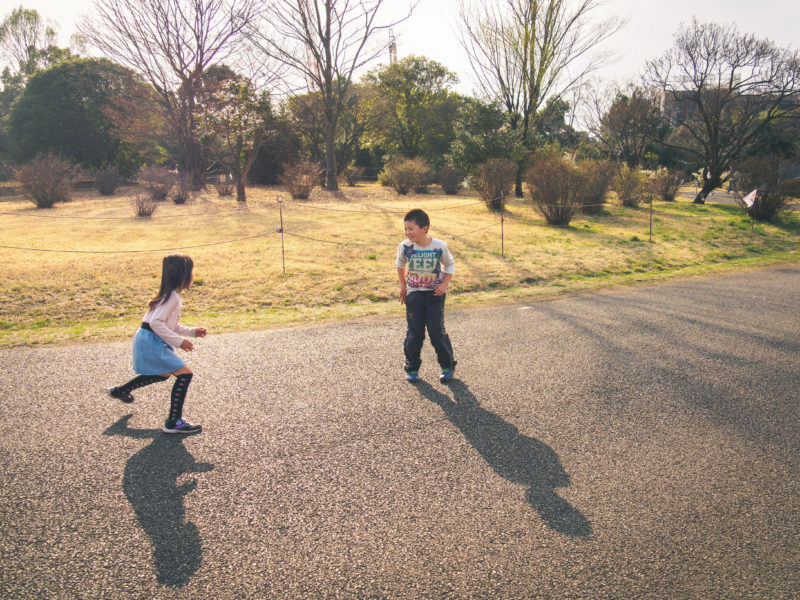 Keidoro (sometimes called dorokei) is a variation of tag played outside among Japanese schoolchildren where half the kids are police and the other half are thieves. It’s the classic tale of cat and mouse. There are many regional variations to this game but at the basic level, the group divides equally between police and thief. The group designates one place for the jail. At the beginning of the game, the police give the thieves some time to disperse. Then the police look for the thieves and if they touch them, they can take the thief to jail. Courageous thieves who have not been caught can rescue thieves from the jail by tapping on them. The game ends when all the thieves are arrested. Oni Gokko is another tag game with just one person being “it”. In Japanese tradition, this person is called oni or demon. The oni is a mythical figure with a human body and horns and makes many appearances as the quintessential evil-doer in children’s stories. 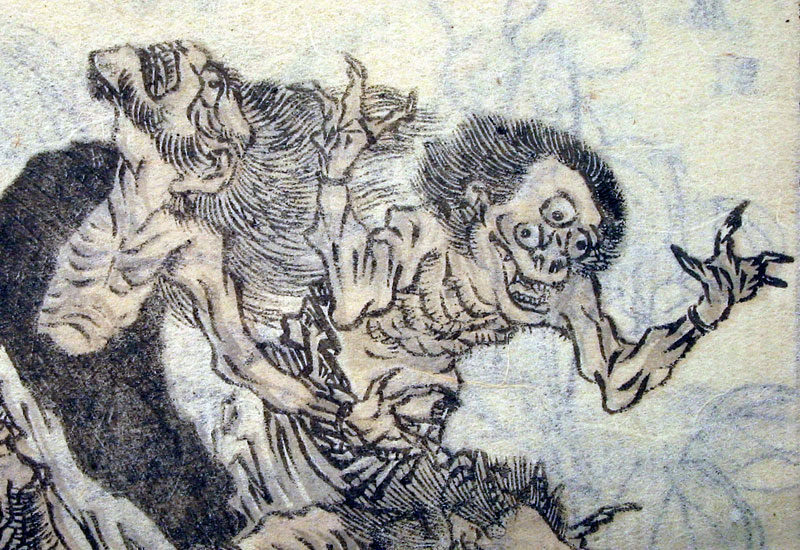 In Oni Gokko, the oni counts to ten with their eyes closed while the rest of the children hide. When the oni is done counting, they yell out, “Are you ready?” (Mou ii kai), to which everyone needs to say “We’re ready” (Mou ii yo) or “Not yet” (Mada da yo). Then the oni searches for each of the children. When they find one, they tap on them and that new kid becomes the next oni. Beigoma is a traditional spinning top game which peaked in popularity in the 20th century during the Showa period. The beigoma is made from metal, usually with a beautifully carved out kanji character written on its top side. Its bottom side comes to a point and you wrap it in cord and pull the cord quickly to give it a spin. The game can be played on any flat surface like the top of a covered barrel. Everyone throws their beigomas at the same time onto the barrel cover. The aim of the game is to knock your opponent’s beigoma out of the ring or just make sure yours is the one that spins the longest. 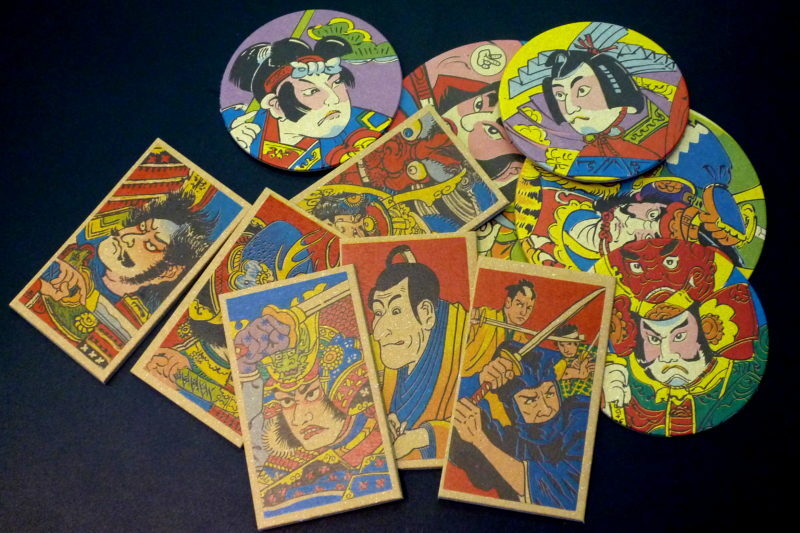 Menko is a card flipping game popular since the Edo period and played by children. You play with cardboard cards with one or both sides decorated with pictures and manga. The game is similar to pog in that the aim is to flip the opponent’s cards over with your own. To start the game, play janken to determine who goes first. Everyone else lays down their cards on the ground. The first player slaps their menko card on the ground to flip the others over. If a card is flipped over, the thrower keeps it and the loser is out. Otherwise, it’s the next person’s turn to try. Ofcourse, you’ll see regional variations on the rules for added complexity. For example, players mark a circular boundary line and the thrower must aim to flip menko cards outside of this boundary. Great for learning Japanese language and common sayings, this game of speed comes in two forms. The simpler version, iroha-garuta, is great for kids and comes with two sets of cards. One set contains a simple Japanese proverb. The other set contains one hiragana character and a corresponding picture. This second set is laid out in front of all the players. 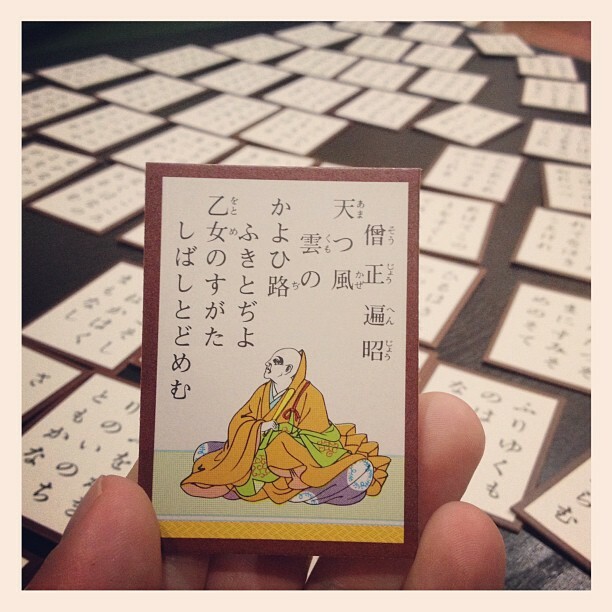 One player will read out the Japanese proverb from the first set while the other players must find the matching picture card. The winner is the first person to find the matching card. For example, the reading card could say “inu mo arukeba bou ni ataru (a dog on a walk may find a stick). The correct matching picture card is the one with the hiragana i (い） and a picture of a dog. The more grown-up version of this game is called uta-garuta. Here, the two sets of cards contain famous poems rather than proverbs. The first set of cards will contain the first three lines of a poem (in a traditional 5-line poem), and the second set will contain the last two lines. The second set of cards are laid out in front of the players. One player will read out the beginning of the poem and the rest of the players must complete the poem as fast as they can to beat everyone else. While karuta waned in popularity in recent times, various clubs around Japan are working to give this game a comeback. Competitions are held nationwide for all age groups. Girls around the world may remember this timeless classic played during recess. Ayatori is the Japanese name for what Westerners might call cat’s cradle. But versions of this game have been found in indigenous cultures all over the world. Either playing alone or with another person, you take a piece of string or yarn about 120cm long and create all kinds of geometric patterns using your fingers (and sometimes even your mouth or wrists). If playing with someone else, the other person will take the string into their hands, creating a different shape. If you mess up and ruin the intended shape, you lose. Almost every possible configuration has at least 2 or 3 natural progressions. But a few rare designs will end the game as there are no more moves available. 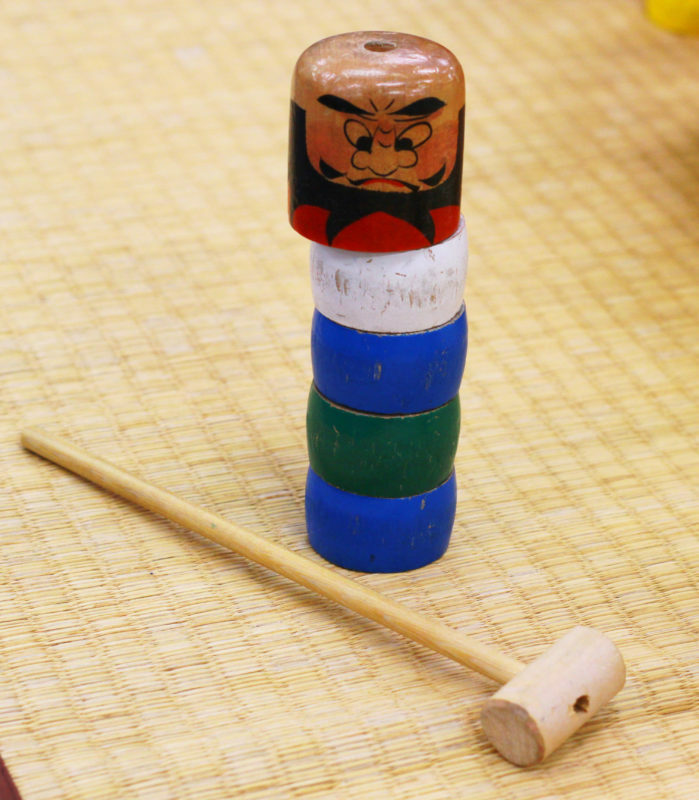 In this game made of wooden pieces, a cylindrical Daruma head sits atop five stacked pieces of wood in primary colors. Players take turns hammering at the bottom piece quickly enough that the pieces above don’t fall. The aim is to get to the Daruma without toppling the stack. You could liken it to Jenga but with a lot more emphasis on collision. We’re including Sudoku here not because it’s a traditional Japanese game but because everyone erroneously thinks it is. Don’t be fooled by the name, this game was actually invented in 1783 by a Swiss mathematician named Leonhard Euler. In 1979, New York-based Dell Puzzle Magazines published the number puzzle under the name Number Place where it started to gain some popularity slowly. A Japanese publisher named Nikoli picked up on the puzzle and began producing it in the 1980s with a translated name of Suuji wa dokushin ni kagiru, meaning ‘the numbers must occur once only’. This was quickly abbreviated to Su Doku ‘number only’ or ‘number single’. The puzzle took off like wildfire from there and was once more exported around the world but this time under its current name, Sudoku. Small changes have been made to the rules over time but the premise remains the same. 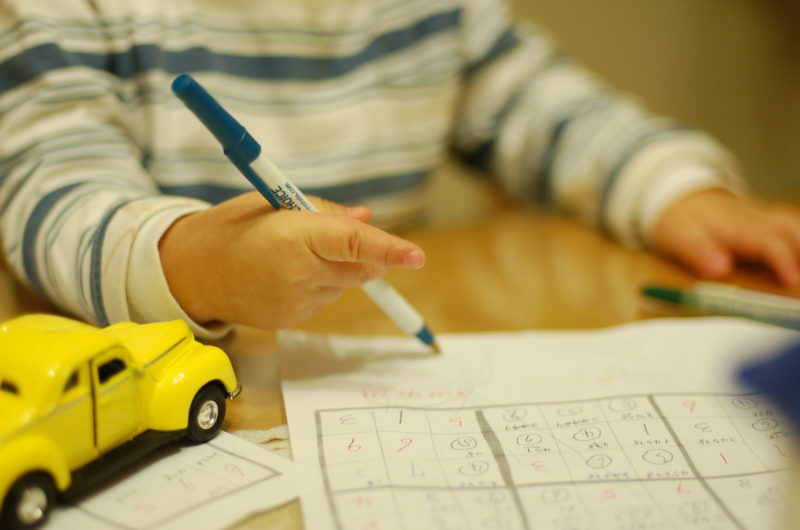 The aim of the game is to fill out an 81-square grid (divided into nine blocks of nine squares each) with a number from 1 to 9. Each number must appear just once in every column, row, and block. The game starts with some squares filled out and you must fill in the rest by using a combination of logic and speed, and, missing those, then just plain luck. The game has since turned into a global craze with the advent of formal competitions and even famous competitors solidifying its status in the world of puzzle games. These are just some of the many traditional games that have a special place in the hearts and memories of Japanese people. The fact that you can find variations on these games all over the world is a testament to their long lasting popularity. Next time you’re in Japan, why don’t you try playing one of these games yourself?